To celebrate their change in brand from Imperial Car Rental to Europcar, Europcar are having a sale on car rental for a limited time only. Rent a car from R135 per day on weekends. Sale rates include 200km’s free per day, standard cover, surcharges and VAT. Stocks are limited and vehicles are subject to availability. Book until 14 June 2009, and rent between 1 June and 30 June 2009. Valid for credit card rentals; vehicles groups are limited and are subject to availability; standard rental terms & conditions apply. 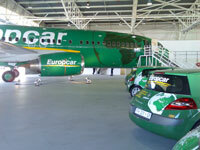 Book this Europcar special.